Aerosol spray paint cans make life easier. They speed up painting jobs, offer a smooth finish without brush or roller marks and enable painting in hard-to-reach places. But, aerosol cans are also hazardous. Both the product and the propellant are usually flammable. Users must store aerosol spray paint cans in flammable safety cabinets that protect them from fire. Always check the Safety Data Sheet (SDS) for your aerosol spray paint cans. This document describes the hazards of the chemicals in the can. OSHA 1910.106 covers flammable liquids. It specifies chemical volume limits for a safety cabinet. There is also a limit on the number of safety cabinets in each area. But, always check local authority requirements along with the national standards. 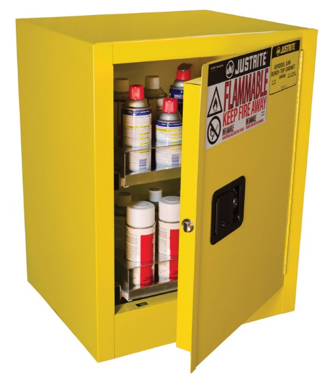 Justrite offers safety cabinets specifically for aerosol can storage. Made from 18-gauge (1.27 mm) double walls of welded steel, the air gap between the walls insulates the spray paint cans from the heat of a fire. Store small quantities of spray paint in Sure-Grip® EX Benchtop Flammable Safety Cabinets. They store up to 24 aerosol cans and use two pull-out drawers for ease of access. The bench top style allows you to place the cabinet close to the worksite. 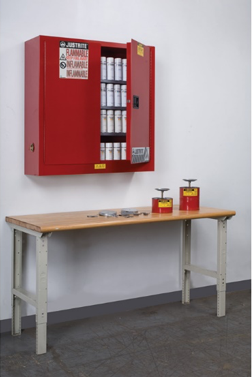 For larger scale users of spray paints, Sure-Grip® EX Wall Mount Aerosol Can Safety Cabinets feature a 20-gallon capacity. They hold up to 168 aerosol cans. Leak-proof bottom sumps contain drips and spills within the cabinet, while the patented SpillSlope® shelf design directs spills backwards towards the sump. Once spent, some product residue and propellant remains in a spray paint can. Used aerosol cans are classified as hazardous waste under the Resource Conservation and Recovery Act (RCRA). Hazardous waste disposal costs for used spray paint cans build up quickly. 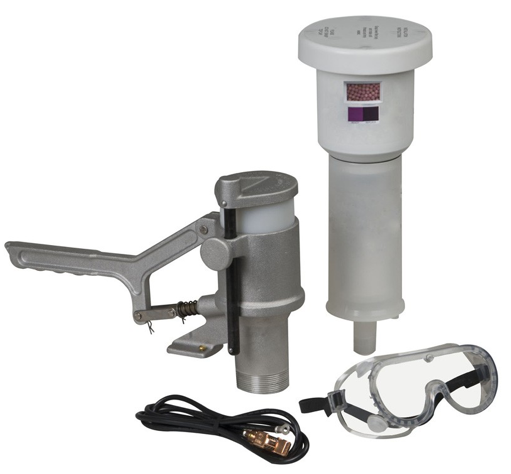 Justrite supplies Aerosolv® Aerosol Can Disposal Systems to safely recycle used spray cans. Mounted on a standard 55-gallon drum, the Aerosolv system punctures used aerosol cans. Product residue falls into the drum for disposal, while an active carbon filter captures volatile organic compounds (VOCs). Spray paint cans processed through the Aerosolv system are no longer considered hazardous waste. They become universal waste, suitable for landfill sites or recycling. Justrite provides flammable safety cabinets to help companies store spray paint cans safely and compliantly in the workplace. See all our chemical storage options here.